Rhubarb is the common name for perennial plants comprising the genus Rheum of the Polygonaceae family, and in particular the garden rhubard, Rheum rhabarbarum, which is popularly cultivated for its long, fleshy, edible leafstalks (petioles), which are sweetened and cooked. Plants of the Rheum genus grow from thick, short rhizomes and are characterized by large leaves that are somewhat triangular shaped, small flowers grouped in large, compound, leafy inflorenscenes, and long fleshy petioles. A number of varieties of rhubarb have been domesticated both as medicinal plants and for human consumption. 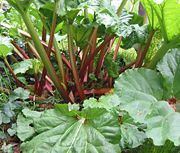 In addition to garden rhubarb, other well-known rhubarbs include false rhubarb (Rheum rhaponticum), used in cooking, and Chinese rhubarb (Rheum officinale), used medicinally (ITIS 1999b, 1999c, 1999d). The rhubarb represents an aspect of human creativity. The leaves themselves are toxic, the stalks themselves have an intense tartness. However, combining them with a sugar makes a delicious food with a unique flavor that can be used in sauces, desserts, and jams, and is so popular for pies that rhubarb in some regions is known as "pieplant" (Herbst 2001). Rhubarb may also be combined with strawberries (a traditional flavor combination in the United States) or with ginger (Herbst 2001). The Rheum genus belongs to the knotweed or smartweed family, Polygonaceae. The name is based on the genus Polygonum. In addition to rhubarb, some well known members include Fagopyrum (buckwheat), Rumex (sorrel), and Polygonum (knotgrass). The family is named for the many swollen node joints that some species have; poly means many and goni means knee or joint, though some interpret goni to mean seed, and the name then would refer to the many seeds these plants often produce. Leaves of Polygonoideae are simple, arranged alternately on the stems, and have a peculiar pair of sheathing stipules known as ocreae. Those species that do not have the nodal ocrea can be identified by having involucrate flower heads. The calyx is petaloid, often in two rows. The flowers are normally bisexual, small in size, actinomorphic with calyxs of three or six imbricate sepels. After flowering, the sepals often become membranous and enlarge around the developing fruit. Flowers lack a corolla and the sepals are petal-like and colorful. The androecium is composed of three to eight stamens that are normally free or united at the base. Flowers have compound pistils composed of three united carpels with one locule—producing a single ovule. The ovary is superior with basal placentation, and two to four stigmas are produced (Jones and Luchsinger 1979). Rheum, the rhubarb genus, is a genus of flowering plants that grow from thick short rhizomes. Rheum species are herbaceous perennials with hermaphrodite flowers, consisting of a colored perianth, composed of six to nine segments, arranged in two rows. The flowers typically are small, greenish-white to rose-red and they have nine stamina inserted on the torus at the base of the peranthium. The flowers are free or subconnatent at their base. The ovary is simple and triangular shaped with three styles. The fruits are a three-sided caryopsis with winged sides and the seeds are albuminous and have straight embryos. The plants have large leaves that are somewhat triangular shaped with long fleshy petioles. The celery-like stalks can vary from deep red to red, with pink or speckled in between. The genus Rheum is represented by about 60 extant species (Wang et al. 2005). Among species found in the wild, those most commonly used in cooking are the "garden rhubarb" (R. rhabarbarum) (ITIS 1999b) and R. rhaponticum, which, though a true rhubarb, bears the common name "false rhubarb" (ITIS 1999c). The many varieties of cultivated rhubarb more usually grown for eating are recognized in general as Rheum x hybridum in the Royal Horticultural Societies list of recognized plant names. The drug rheum is prepared from the rhizomes and roots of another species, R. officinale, known as "medicinal rhubarb" or "Chinese rhubarb" (ITIS 1999c). This species is also native to Asia, as is the [Turkey rhubarb]] (R. palmatum), which sometimes also is called Chinese rhubarb (ITIS 1999e). Another species, the Sikkim rhubarb (R. nobile), is limited to the Himalayas. Rheum species have been recorded as larval food plants for some Lepidoptera species including brown-tail, buff ermine, cabbage moth, large yellow underwing, the nutmeg, setaceous Hebrew character, and turnip moth. Rhubarb is indigenous to Asia, and many suggest that it was often used by the Mongolians; particularly, the Tatars tribes of the Gobi. The plant has grown wild along the banks of the Volga for centuries; it may have been brought there by Eurasian tribes, such as the Scythians, Huns, Magyars, or Mongols. The term rhubarb is a combination of Greek rha and barbarum; rha being a term that referred both to the plant and to the Volga River (McGee 2004, 366). Varieties of rhubarb have a long history as medicinal plants in traditional Chinese medicine, but the use of rhubarb as food is a relatively recent innovation, first recorded in seventeenth-century England, after affordable sugar became available to common people, and reaching a peak between the two world wars. Rhubarb first came to America in the 1820s, entering the country in Maine and Massachusetts and moving west with the settlers (Waters et al. 2002). Rhubarb is now grown in many areas and thanks to greenhouse production is available throughout much of the year. Grown primarily for its fleshy petioles, commonly known as rhubarb sticks or stalks rhubarb is a vegetable that plays at being a fruit. In temperate climates, rhubarb is one of the first food plants to be ready for harvest, usually in mid to late Spring (April/May in the Northern Hemisphere, October/November in the Southern), and the season for field-grown plants lasts until September. In the Northwest United States, there are typically two harvests: one from late April through May and another from late June and into July. Rhubarb is ready to be consumed as soon as it is harvested, and freshly cut stalks will be firm and glossy. 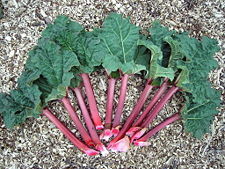 The color of the rhubarb stalks can vary from the commonly associated deep red, through speckled pink, to simply green. The color results from the presence of anthocyanins, and varies according to both rhubarb variety and production technique. The color is not related to its suitability for cooking (RC 2004). The green-stalked rhubarb is more robust and has a higher yield, and the red-colored stalks are more popular with consumers. 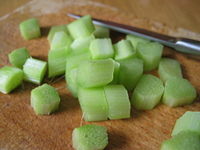 The stalks, which are petioles, can be cooked in a variety of ways. Stewed, they yield a tart sauce that can be eaten with sugar and other stewed fruit or used as filling for pies, tarts, and crumbles. This common use led to the slang term for rhubarb, "pie plant." Cooked with strawberries or apples as a sweetener, or with stem or root ginger, rhubarb makes excellent jam. It can also be used to make wine and as an ingredient in baked goods. In former days, a common and affordable sweet for children in parts of the United Kingdom and Sweden was a tender stick of rhubarb, dipped in sugar. In the UK the first rhubarb of the year is grown by candlelight in dark sheds dotted around the noted "Rhubarb Triangle" of Wakefield, Leeds and Morley (Wakefield), a practice that produces a sweeter, more tender stalk (McGee 2004, 367). In warm climates, rhubarb will grow all year round, but in colder climates the parts of the plant above the ground disappear completely during winter and begin to grow again from the root in early spring. It can be forced, that is, encouraged to grow early, by raising the local temperature. This is commonly done by placing an upturned bucket over the shoots as they come up. Rhubarb is used as a strong laxative and for its astringent effect on the mucous membranes of the mouth and the nasal cavity. The roots have been used as strong laxative for over 5,000 years (Foster and Yue 1992). The roots and stems are rich in anthraquinones, such as emodin and rhein. These substances are cathartic and laxative. Rhubarb leaves contain poisonous substances. Specifically, they contain oxalic acid, a corrosive and nephrotoxic acid that is present in many plants. The LD50 (median lethal dose) for pure oxalic acid is predicted to be about 375 milligrams per kilogram body weight, or about 25 grams fro a 65 kilogram (~140 pound) human. While the oxalic acid content of rhubarb leaves can vary, a typical value is about 0.5 percent (Pucher et al. 1938), so a rather unlikely five kilograms of the extremely sour leaves would have to be consumed to reach an LD50 dose of oxalic acid. However, the leaves are believed to also contain an additional, unidentified toxin (Perez 2006). In the petioles, the amount of oxalic acid is much lower, only about 2 to 2.5 percent of the total acidity (McGee 2004), especially when harvested before mid-June (in the northern hemisphere). Foster, S., and C. Yue. 1992. Herbal Emissaries Bringing Chinese Herbs to the West: A Guide to Gardening, Herbal Wisdom, and Well-being. Rochester, Vt: Healing Arts Press. ISBN 0892813490. Integrated Taxonomic Information System (ITIS). 1999a. Rheum L.. ITIS Taxonomic Serial No. : 21318. Retrieved June 9, 2008. —. 1999b. Rheum rhabarbarum L. ITIS Taxonomic Serial No. : 504747. Retrieved June 9, 2008. —. 1999c. Rheum rhaponticum L.. ITIS Taxonomic Serial Number 21319. Retrieved June 9, 2008. —. 1999d. Rheum officinale Baillon. ITIS Taxonomic Serial No. : 506563. Retrieved June 9, 2008. —. 1999e. Rheum palmatum L.. ITIS Taxonomic Serial No. : 506564. Retrieved June 9, 2008. Jones, S. B., and A. E. Luchsinger. 1979. Plant Systematics. New York: McGraw-Hill. ISBN 0070327955. McGee, H. 2004. On Food and Cooking: The Science and Lore of the Kitchen. New York, NY: Scribner. ISBN 0684800012. Perez, E. 2006. Rhubarb leaves poisoning. Medline Plus. Retrieved June 9, 2008. Pucher, G. W., A. J. Wakeman, and H. B. Vickery. 1938. The Organic acids of rhubarb (Rheum hybridum). III. The behavior of the organic acids during culture of excised leaves. Journal of Biological Chemistry 126(1): 43-54. Retrieved June 9, 2008. Rhubarb Compendium (RC). 2004. Rhubarb varieties. Rhubarb Compendium. Retrieved June 9, 2008. Wakefield Metropolitan District Council. Rhubarb. Wakefield Metropolitan District Council. Retrieved June 9, 2008. Wang, A., M. Yang, and J. Liu. 2005. Molecular phylogeny, recent radiation and evolution of gross morphology of the rhubarb genus Rheum (Polygonaceae) inferred from chloroplast DNA trnL-F sequences. Annals of Botany 96(3): 489-498. Retrieved June 9, 2008. Waters, A., A. Tangren, and F. Streiff. 2002. Chez Panisse Fruit. New York, NY: Harper Collins. ISBN 0060199571. This page was last modified on 25 June 2008, at 03:34.